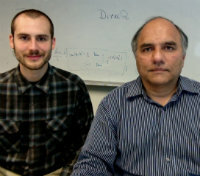 Professor of Physics Sriram Shastry, and a recent undergraduate major, John G. Wright, have just released a software package named DiracQ, for use in the study of "Quantum Many Body Problems". This is a class of problems in quantum mechanics of many particles, and is of vital importance in Condensed Matter Physics, Chemistry, Nuclear Physics and related areas. Their package uses and extends the capabilities of Mathematica, a widely used tool for mathematical analysis. Wright completed his senior thesis project with Shastry, and this research project evolved into the software package. It should be of value to scientists in a wide range of disciplines. Shastry is a well known leader in theoretical condensed matter physics; Wright is now a teacher at Pacific Collegiate School in Santa Cruz.